Is San Juan safe for family travel and have they recovered from the 2017 hurricanes? Hurricanes are one of those things that you just have to experience to appreciate. As a resident of Florida, I've experienced hurricanes, but nothing compares to a CAT-4 or CAT-5 storm. The island of Puerto Rico experienced two near-direct hits from CAT-4 or higher hurricanes in 2017. The island and its people have endured so much in the past year or so. Puerto Rico's capital of San Juan has largely recovered from the hurricanes of 2017, but they may never be the same as they were before the storms. My family and I visited San Juan, Puerto Rico in March of 2018, six months after hurricane Maria. Here is our experience from that visit. *The short answer is "yes", but there's way more to it than that. Is the aftermath of hurricane Maria a real catastrophe? A full 6 months after the storm, and the effects could still be seen and felt by locals and visitors alike. My home town of Orlando, Florida was hit by hurricane Irma in 2017. Irma came through as a CAT-2 storm and the people of Florida nearly lost our minds before and during the storm. What we experienced in Florida was nothing compared to what the island of Puerto Rico endured, not only during the storm but after during their "recovery" as well. Check out this gallery of photos from the aftermath of hurricane Maria in Puerto Rico and see for yourself. You can see some of the scope of the devastation the island and its people endured, and continue to endure to this day. A full 6 months after the storm, and the effects could still be seen and felt by locals and visitors alike. We knew back in November that we wanted to visit Puerto Rico as soon as we could, but without being a burden to the residents. When we booked a vacation just two months after hurricane Maria, we had serious doubts that the island would have recovered in time - and we booked nearly 6 months in advance of our trip! While San Juan has largely recovered, there are parts of the island that still don't have power. Many people, even in San Juan, haven't returned to the "normal" they knew before the storms. They may never know that kind of normal again. That sounds like a catastrophe to me. 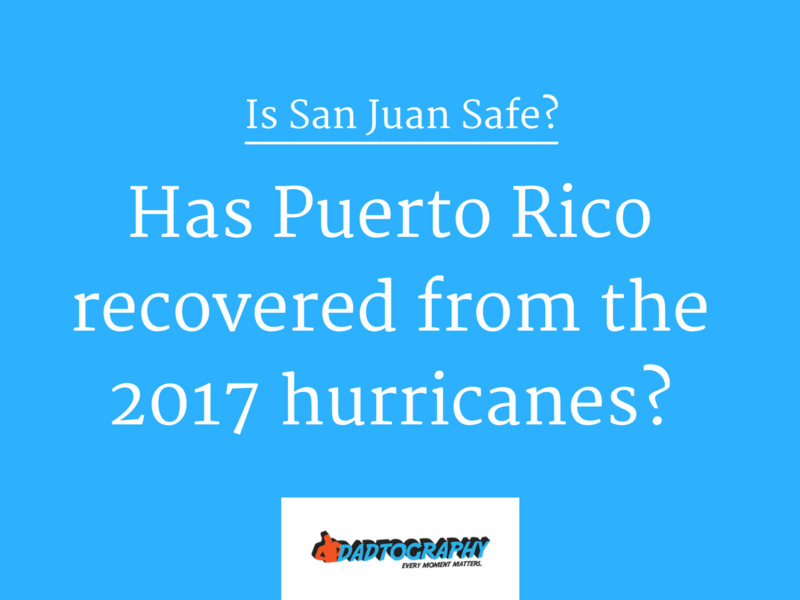 Is San Juan safe? Should I feel comfortable taking my family to the island? Yes! But read our top tips before you go. When is the best time to visit San Juan, Puerto Rico? How about now? A major step in Puerto Rico's return to its "new normal" is for tourism to return to the island. Family travel shouldn't be risky. When you spend your family's time and money and travel together, you want to make sure you're safe and that you have a good time. One of the biggest hurdles San Juan has had to overcome is the stigma that it's not safe for visitors. San Juan is safe - for the most part, they have stable power and utilities service. However, not all power has been restored to the entire island yet, so you should use caution when traveling in more rural and mountainous areas. In my family's time in Puerto Rico, we walked all over the part of the capital known as Old San Juan. This is an island of the city located in the north-west corner. Walking Old San Juan was a great experience for us. There are numerous historic castles or castillos within walking distance of each other in Old San Juan. Walking the city also allowed us to see and talk with more locals and find shops and restaurants that we may have missed if we were in a car or bus. Walk, fly, float or whatever you prefer, the people of San Juan rely on tourists returning to their city to spend money in their shops, hotels, restaurants and bars. The best time to travel to San Juan very well be now. How are the conditions in Puerto Rico after the storms? The major resorts have recovered, but venture off the path most traveled for some one-of-a-kind experiences in your travels. Some of the most enjoyable experiences I've had while traveling have been outside of the typical tourist areas. Yes, the majority of the time we spent while in San Juan was in Old San Juan, which is a very popular part of town for visitors. However, we walked a lot of the brick back streets and explored parts of the city that most visitors likely don't see. In our exploration, we were able to find a great, authentic Puerto Rican restaurant that had blocked off the brick street in front of the restaurant and teamed up with two other bars and restaurants in the area to have a mini street party. We took the time to sit, enjoy a local Puerto Rican beer, a fantastic mojito, a few delectable appetizers and people watch as other travelers and locals walked by. Resorts are great, and they need our support as well, but those really impacted by hurricane Maria are in the back streets of San Juan, so be sure to dig a little deeper in your exploration of San Juan. Explore deeper - you'll have a chance to drink unique drinks, eat unique food, and most importantly, you'll meet unique people. How has Puerto Rico recovered since Hurricane Maria? The people that either endured living through hurricane Maria or have returned since the storm work hard, but appreciate your generosity. Traveling as a family has really opened my eyes. I've seen people, places and circumstances that I wouldn't have experienced had I stayed home. One of the first things that I noticed as my family and I explored Old San Juan is how hard working the people there are. I saw vendor carts and entrepreneurial Puerto Ricans doing what they needed to do to make money to support their families. They were solving problems that no one else seemed to be willing to help them solve. One vendor that stood out to me had a tent setup near Dársenas Square, very close to the port of San Juan. The vendor was selling home-made baked goods that the family had made that morning. On display, they had quesitos de guayaba, mallorca bread and even Puerto Rican pineapple rum cake. The foods were irresistible and the work ethic and dedication of the people out there selling what they made to support their families was inspiring. Not only did I purchase more than a few items, but I also gave them a little extra as well. What is it like to live in post-Maria Puerto Rico? The people you leave behind will be there tomorrow. Get to know what their world is like by getting to know them as a person. It's not a rhetorical question. I asked myself this very question on my last trip with my family. Your reasons for traveling may vary from mine, and that's okay. But I've found my travels to be much more enjoyable when I make it a point to have conversations with people that live in the places that I'm just passing through. What does a day in the life of a local look like? Sound like? Smell like? If you're only spending a short amount of time, you're experience with a destination like San Juan will be limited to what you see, hear, smell and do. Locals? They live that life every day. During our time in San Juan, we spoke to a local resident that rode out the worst that hurricane Maria had to offer. He was there when the storm passed, the sun came up and everyone came out to witness the devastation first-hand. Did he abandon his family and neighbors after weeks of no power or fragile service? No. He was there when life finally started to return to normal. I could almost hear it in his voice - the sound of uncertainty. He wasn't sure if he'd be able to make it through something like that again. I saw some fantastic sights during my time in San Juan, but it was this man's story of what it was like to live through, and after hurricane Maria that I'll never forget. I've found my travels to be much more enjoyable when I make it a point to have conversations with people that live in the places that I'm just passing through. What do you think - is San Juan safe for tourists to return? Have you visited Puerto Rico recently? Share your thoughts in the comments!